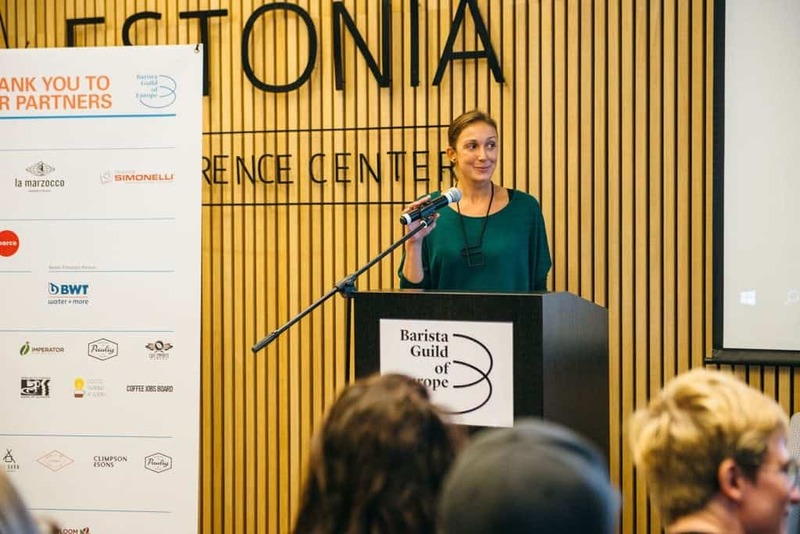 Barista Guild of Europe brought 125 baristas from over 26 countries to participate at their annual event, third European Barista Camp. This time it was to Estonia. The location might surprise someone who knows there has been no active SCAE chapter in Estonia, resulting in no competition being organised for years. But isn’t that the right motivation to bring the event in the area? 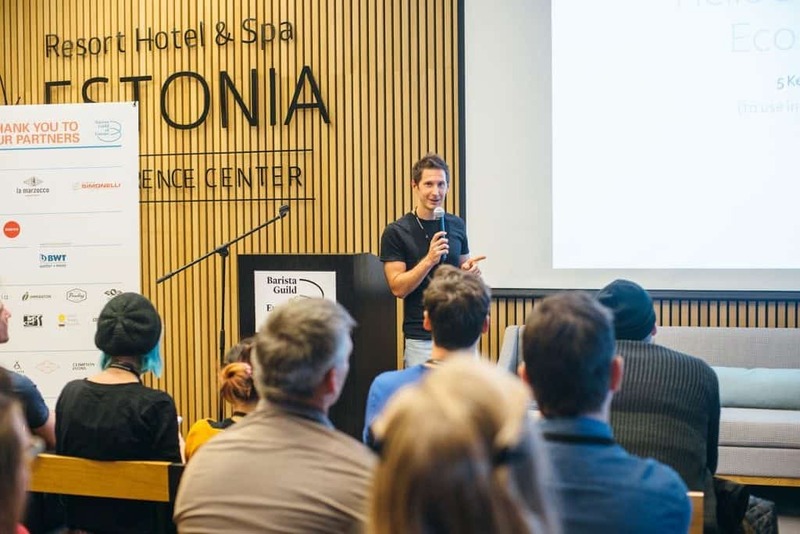 The camp took place on the coast of Estonia, in a small town of Pärnu. It is also known as Estonian summer capital. Off season, Pärnu is more calm, less crowded and cold, but after a morning run on the beach anyone would be ready for the day. 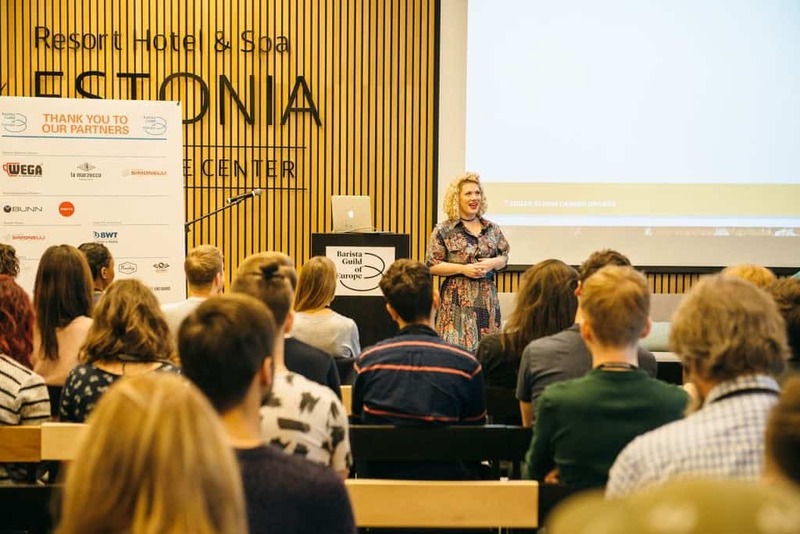 Estonia Hotel Resort & Spa provided the campers with all the comfort, great food, and technical support to take their lecture in prepped class rooms, before heading to their on-site spa baths. The spa felt even better considering the cold weather outside. The camp was spread over 4 Intense days of learning. 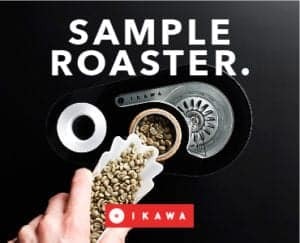 Participants could choose one of 7 SCAE educational modules, based on their preference in brewing, sensory training or perhaps green bean understanding. Outside of the learning modules, inspirational talks by coffee industry professionals were open to all participants, enriching their learning experience even further with knowledge from various fields from the likes of brand designer and coffee writer Brian W. Jones, propagator of speciality tea Shawn Barber or Nicaraguan coffee producer Claudia Lovo. All that the participants needed was to focus. 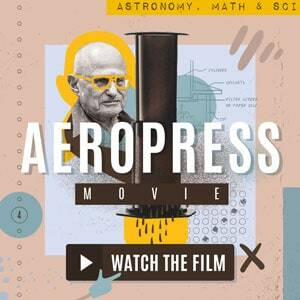 They were fueled by more than sufficient amounts of great coffee brewed in the hotel. 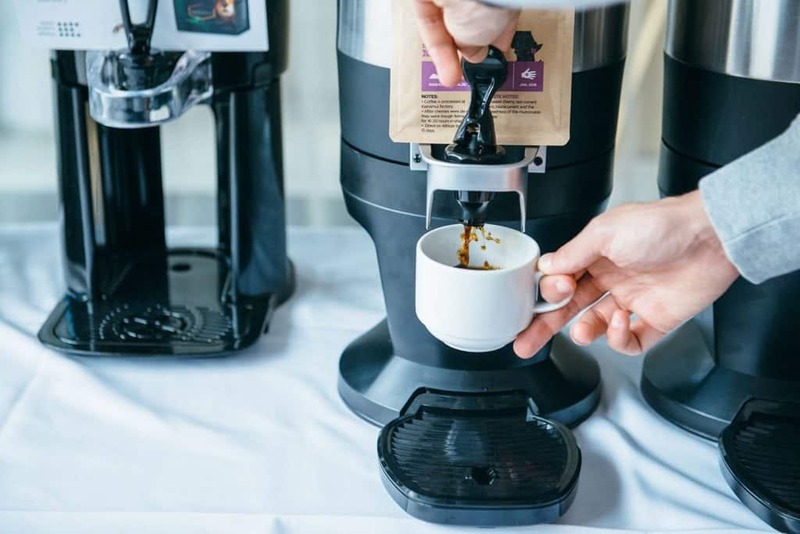 The coffee prepared by volunteers for all the participants was brewed using Marco JET and BUNN batch brewers, delivering black filter from beans sponsored by Rocket Bean, Five Elephant, The Barn, Cuperus, Climpson & Sons and Paulig roasteries. Upon the arrival participants were greeted by Barista Guild of Europe members and volunteers who gave away a goodies bag to everyone. Decorated with fresh illustrations, its unpacking was a favourite activity of the first day. Cupping spoon by W.Wright, notebook by James Hoffman of Coffee Jobs Board, or reusable take-away cup by Klean Kanteen to name some of our favorite items got the participants ready and excited for the beginning of the lectures. 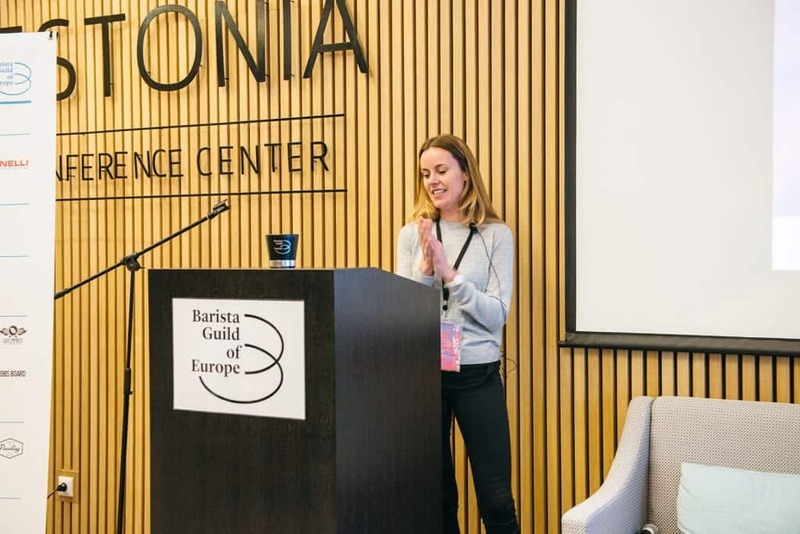 Isa Verschraegen and Tibor Varady then officially opened the Barista Camp with a short warm talk that was followed by a series of sponsors’ presentations in the style of Pecha Kucha presentation. It must have been a real challenge for each company’s representative to explain their company’s vision in 20 slides, at the speed of a slide per 20 seconds. 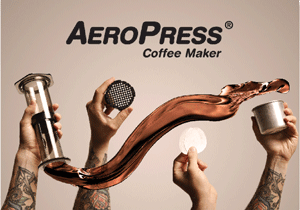 That was accepted by Lauro Fioretti of Nuova Simonelli, Lorraine O'Hagan of Marco, Giulia Spanio of BUNN, Henry Hoogeveen of Klean Kanteen and Stefano Gava of WEGA. It was just enough of presenting, all participants were excited to start the educational program with their first afternoon session. Every morning, after a delicious breakfast, a morning run or a yoga session organised by the Guild (thumbs up for supporting healthy habits of baristas! ), the day of SCAE courses began and baristas left to their classes and workshops. After lunch though they reunited again in the lecture hall to be inspired and educated by six great speakers, who were equally divided into two days. This year, we observed a shift in the speakers’ presentations topics. 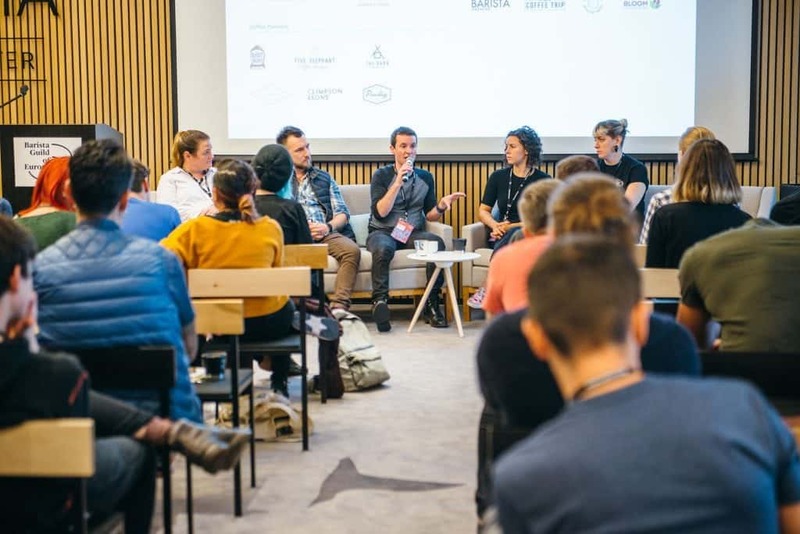 Instead of focusing mainly on technical themes as it was last year, such as water chemistry, science of grinding and defects in coffee, the speakers opened up conversation on branding, career development and behaviour economics. Through the talks baristas had hence the opportunity to develop their knowledge and understanding of multiple aspects of the coffee industry. 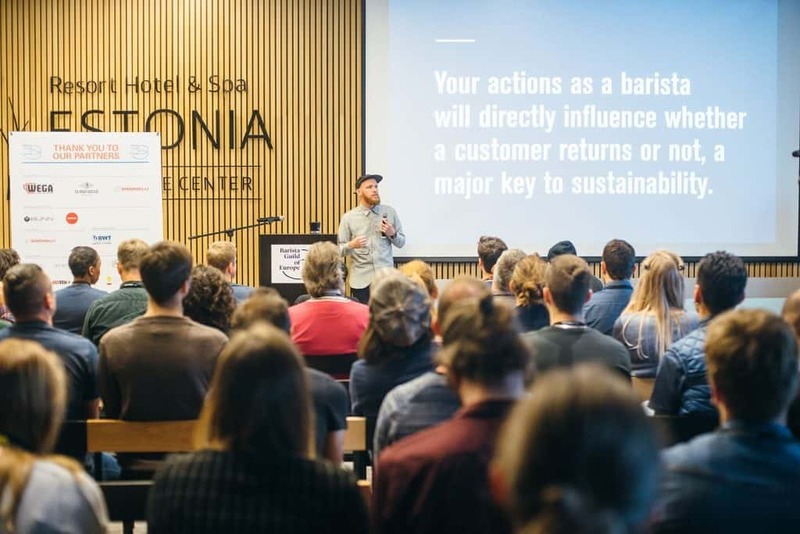 Brian W. Jones, founder of DCILY and brand designer of AKA Coffee aka Supersonic Coffee, Workshop Coffee or Get Them Tiger explained in his talk “Barista AKA Brand Ambassador” what a brand might mean to every coffee business and what aspects you, as a barista could influence. 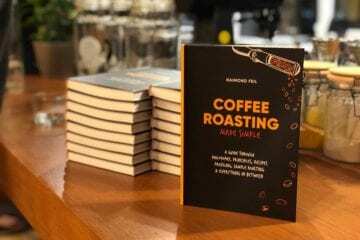 As such you are often the face of the business and “your value as a barista far surpasses how well you make coffee, and making coffee is the least valuable part.” Brian suggested that you might be better off reading Setting the table by Danny Meyer than Water for Coffee by Maxwell Colonna Dashwood and Christopher H. Hendon. Why? 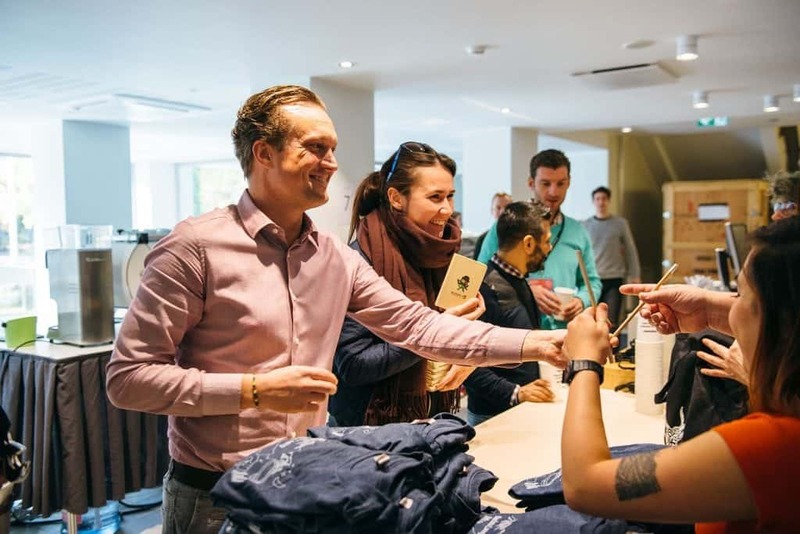 “How many of you can really influence water in your cafe [ … ], how many of you interact with guests on a daily basis?,” Brian followed his food-for-thought serving. 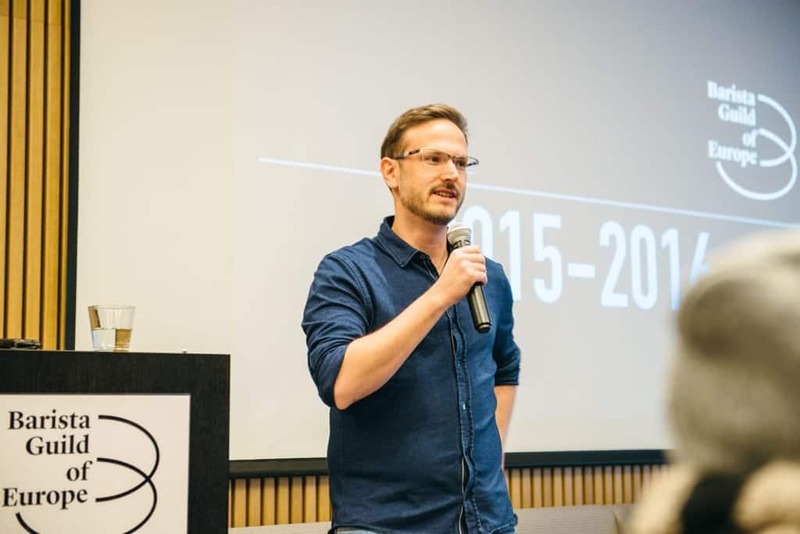 Jerome Ribot, founder of Coglode summarised his research experience in a talk called “Hello Behavioural Economics.” What can you take away from behavioral economics studies to your coffee business? One of many principles says that people tend to go with default options. 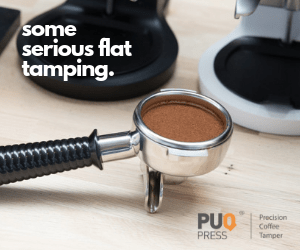 If Jerome asked you: “What is your default – black, white or filter coffee? How does it support your business objective, and do you have your default options at all?”, what would you reply? Another example of behavioural economics is the paradox of choices. In general, the fewer choices (or barriers) we put in front of our customer, the more sales we can expect. 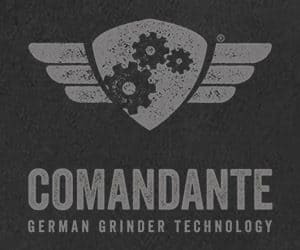 Shawn Barber is a Canadian now living in Berlin, Germany where he had helped establish several businesses before opening his own – Companion Coffee and Tea. In his talk he argued that as long as we want to drink good speciality coffee, we should consider also tea! Shaun took us on his first tea exploration trip to India where he met 13 tea growers from Nepal. Then he talked about 4 main types of tea, how they vary in processing and taste, and we were then able to compare them ourselves in a following tea degustation. Shaun brought a BAI MU DAN (white tea from Nepal), WHITE FOREST (white tea from Nepal), SAKURA (green tea from Japan) and LAKYRSIEW (black tea from India). A range that we can currently find at his cafe as well. Following panel discussion led by Sarah Ellen of BARISTA MAGAZINE brought four coffee people with different backgrounds to share their personal stories of “How Did I Get Here”. Turning the attention of the participants more towards their own career options was achieved with the contribution of the panelists, among whom were present Mārtiņš Dzenis (Rocket Bean), Matthew Scott (Barista Guild of America), Charlotte Horton (Cafe Imports) and Sam Sullivan (Barista Guild of Europe). They all have had an interesting path within the specialty coffee so far, and were a nice inspiration to the Campers. At the end of the second day it was about time to take a full advantage of the hotel resort. Everyone put their swimwear on and went to enjoy the evening pool party. It was a great finish to a full day of lectures. 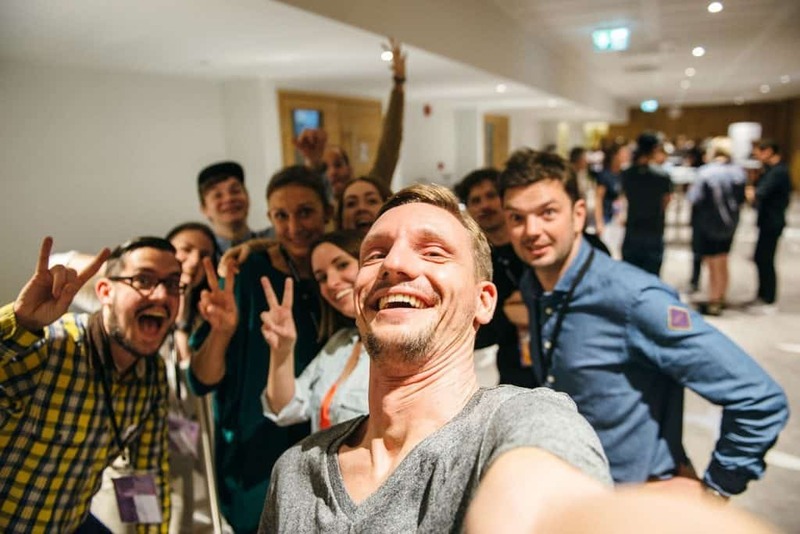 Participants of different courses bonded together, before bringing their focus back the next day. Early next morning, participants that did not sleep in could take a written exam with the always-present Educational Field Manager Annemarie Tiemes, or come to the class earlier to practice for their exams. A class was ready for Barista Intermediate course, with 6 different espresso machines provided by 3 manufacturers. 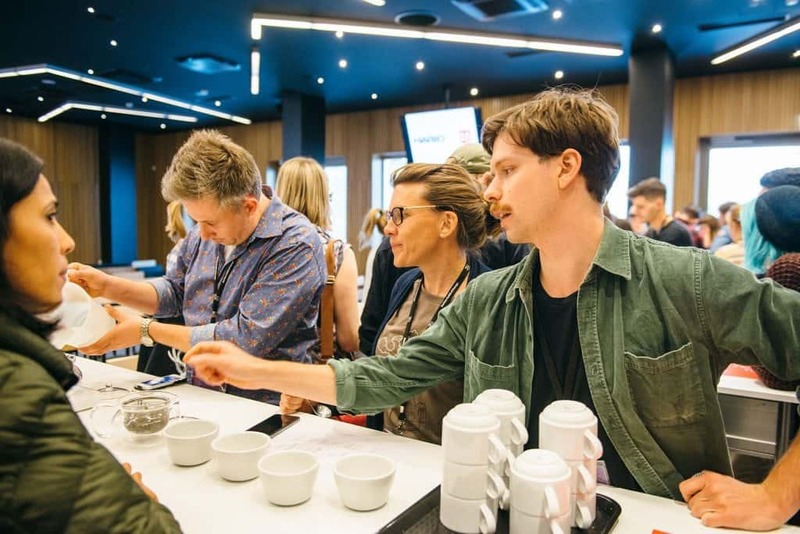 A brewing class where many people operated Aeropress, Chemex or V60 for the first time in their life was also opened, as was the challenging Sensory intermediate class, for baristas to practice with aroma kits from Le Nez du Cafe. They were about to prove their competence in the sensory analysis of coffee and every practice was worth it, in order to receive their diploma at the end of the Camp. The second afternoon of talks was kicked off by Rachael Power, Head of people at Taylor St Baristas in London. 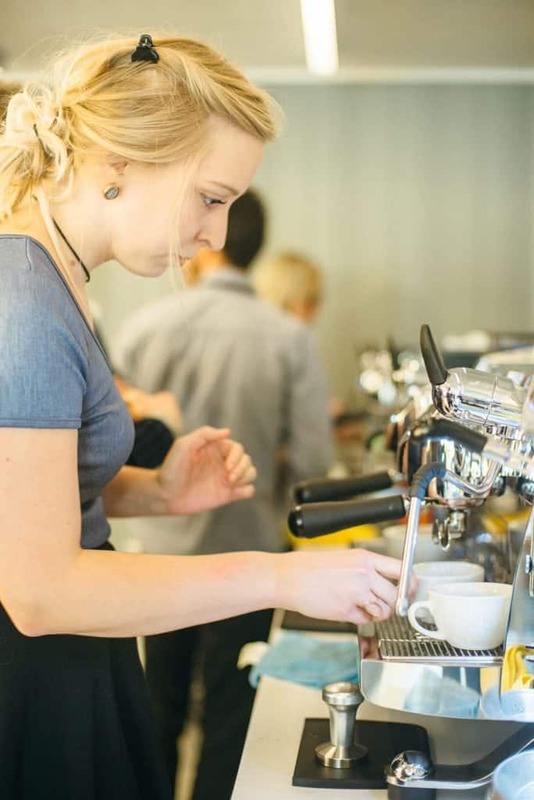 In her talk “Progression: Navigating Your Coffee Career” Rachel emphasised self awareness as the key to realising where do we stand and where do we want to go in our career. “If you don’t like manual labour, don’t dream about roasting one day”, was perhaps an eye-opening piece of advice to many. 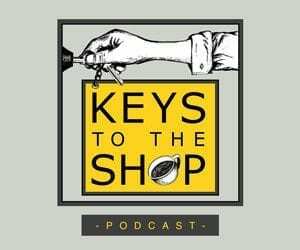 Generally speaking, it is a good idea to focus on personal relationships and transferable skills that will serve you well, even if you decide to leave the coffee industry one day. 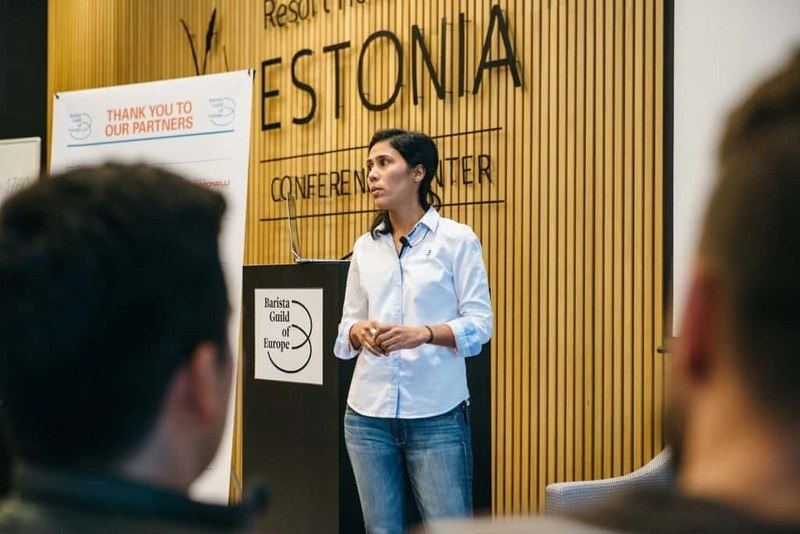 Claudia Lovo, a coffee producer associated with Cafetos de Segovia located in Nueva Segovia, Nicaragua prepared a presentation titled “Is Specialty Coffee The Solution Or Only Part Of The Solution?”. Claudia came to the Camp to provide a realistic perspective of the production of coffee, which can easily be a romanticized topic. 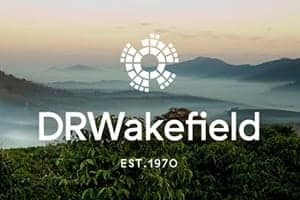 She provided an interesting overview of the whole coffee market and where it leads to. Interestingly, she compared the costs of production of commercial coffees and speciality coffees (the ones graded 80+) and she emphasized the risks it involves to focus only on the highest quality coffee. 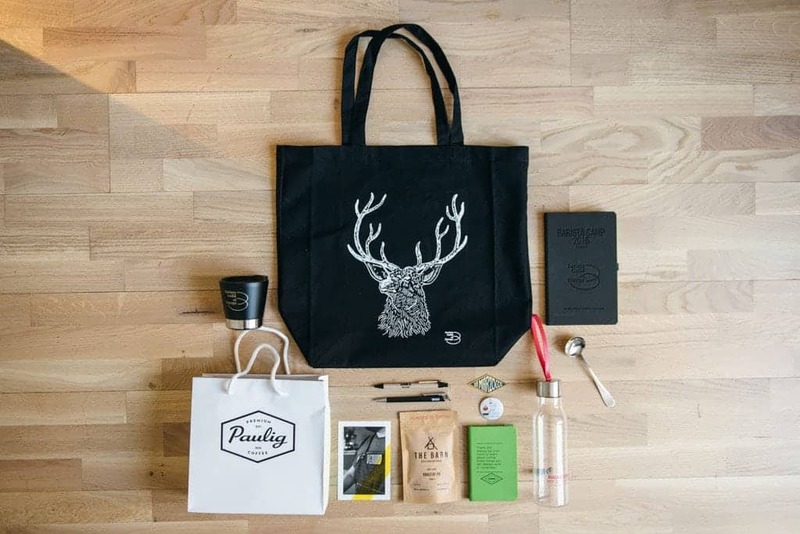 Mette-Marie Hansen is a coffee trader at Sucafina in Geneva, Switzerland. With 17 years of experience within the coffee industry she came to share a talk on “The Future of Coffee, And The Future Market”. In it she uncovered the daily workload behind a trading desk. She explained what was the difference between coffee that is traded on a commodity market and the one traded directly. Marie also shared her personal experience from working in East Africa and what were her thoughts on helping at coffee origins. Tibor Varady closed the second line-up of speakers with a review of accomplishments and also failures of the BGE working group. 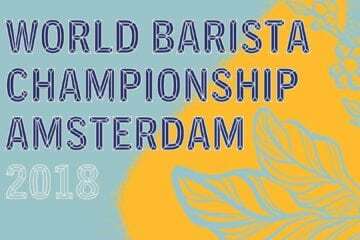 The events organised by the BGE are organised by baristas for other baristas, and it is only up to the community to work on what is needed. Yanis Apostolopoulos stepped in briefly to discuss the SCAE and SCAA unification and what it actually means for both guilds. It seems it will only bring a better chance to meet and share information with American colleagues, and it will be up to both guilds to use it to its best advantage. In the coming months, BGE will be generously sharing all the Camp talks that we recorded on site. Don’t miss it and subscribe to their Youtube channel now. 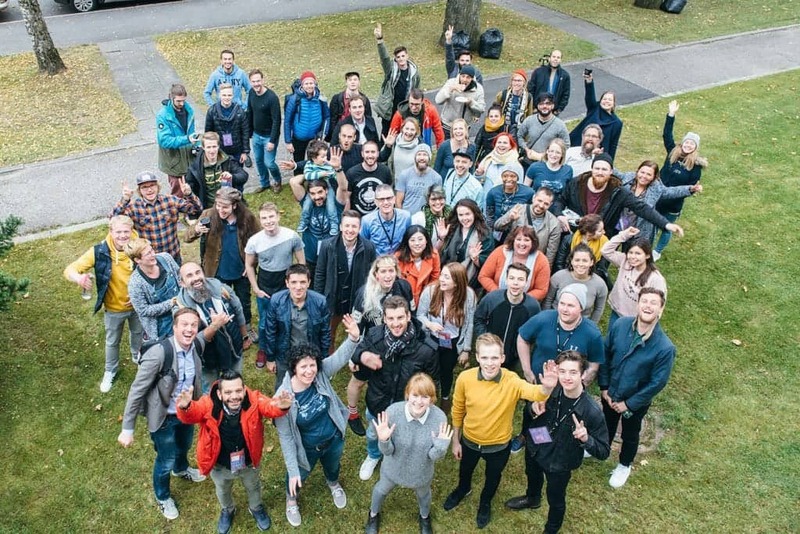 Barista Camp was an intense experience that mixed both education and fun. 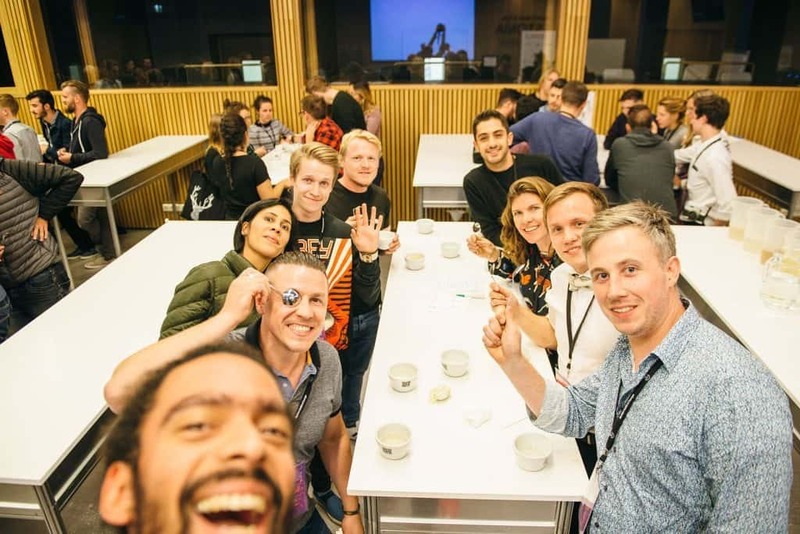 Yet again, Barista Guild of Europe managed to organise a great event that ran smoothly, delivering a great amount of knowledge to the campers, while also building a stronger feeling of the European coffee community. 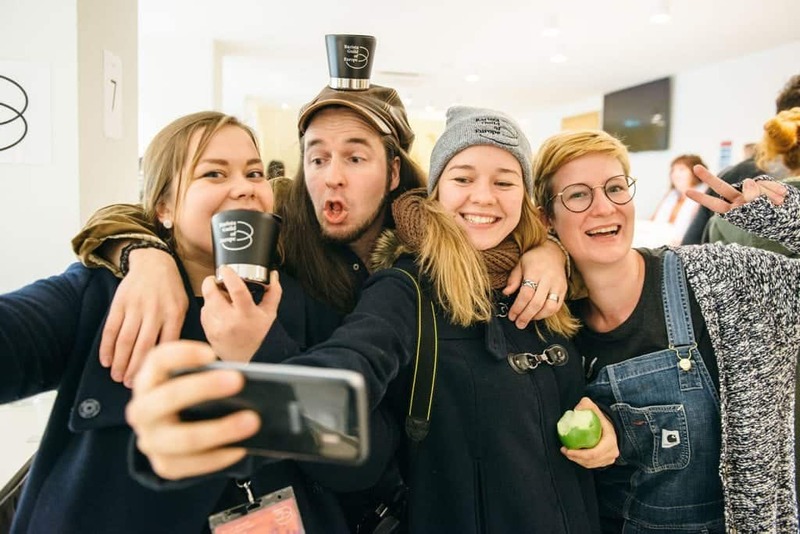 Baristas and coffee professionals from all around Europe were leaving the Camp with new experience, equipped with improved skills, and with connection to new friends they can share the wins and struggles with. Anyone said anything about the perfect brew ratio or the tasting notes of their latest brew? Thank you Barista Camp for such a great event. 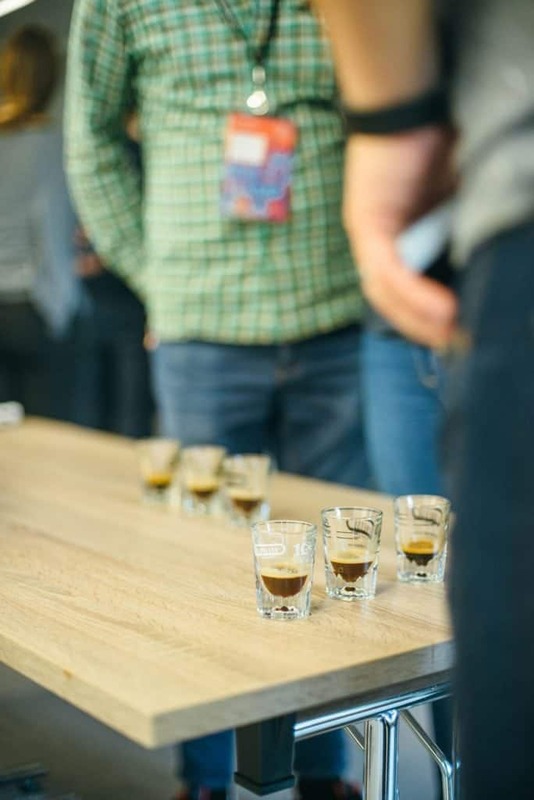 We strongly believe that coming to Barista Camp either as a participant, a volunteer or a trainer is one of the best investments a coffee person can do. See you all next year! Photo: Jordan Sanchez, the official photographer of the last three BGE Barista Camps is also the co-owner of Cedar Coffee Supply in Alpine, Texas.